This entry was posted in Books and tagged Epictetus, Stoicism on November 17, 2015 by Blas. What greater evil could you wish a miser, than along life? 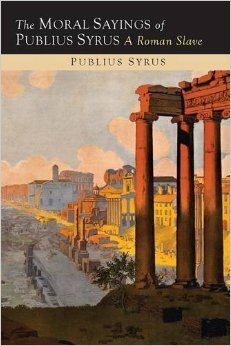 This entry was posted in Books and tagged History, Philosophy, Publius Syrus, Stoicism on March 31, 2015 by Blas. Seneca, a Stoic philosopher, offers his view on how to live successfully and happily (by being in the moment and not worrying about the past or future since there is nothing you can do about either), the importance of reason and morality and provides timeless wisdom which is just as relevant today as it was millennia ago. Everyone hurries his life on and suffers from a yearning for the future and a weariness of the present. But he who bestows all of his time on his own needs, who plans out every day as if it were his last, neither longs for nor fears the morrow. For what new pleasure is there that any hour can now bring? They are all known, all have been enjoyed to the full. But no one sets a value on time; all use it lavishly as if it cost nothing. But see how these same people clasp the knees of physicians if they fall ill and the danger of death draws nearer, see how ready they are, if threatened with capital punishment, to spend all their possessions in order to live! So great is the inconsistency of their feelings. Life is divided into three periods—that which has been, that which is, that which will be. Of these the present time is short, the future is doubtful, the past is certain. For the last is the one over which Fortune has lost control, is the one which cannot be brought back under any man’s power. But men who are engrossed lose this; for they have no time to look back upon the past, and even if they should have, it is not pleasant to recall something they must view with regret. Of all men they alone are at leisure who take time for philosophy, they alone really live; for they are not content to be good guardians of their own lifetime only. They annex every age to their own; all the years that have gone ore them are an addition to their store. Honours, monuments, all that ambition has commanded by decrees or reared in works of stone, quickly sink to ruin; there is nothing that the lapse of time does not tear down and remove. But the works which philosophy has consecrated cannot be harmed; no age will destroy them, no age reduce them; the following and each succeeding age will but increase the reverence for them, since envy works upon what is close at hand, and things that are far off we are more free to admire. The life of the philosopher, therefore, has wide range, and he is not confined by the same bounds that shut others in. He alone is freed from the limitations of the human race; all ages serve him as if a god. He makes his life long by combining all times into one. But those who forget the past, neglect the present, and fear for the future have a life that is very brief and troubled; when they have reached the end of it, the poor wretches perceive too late that for such a long while they have been busied in doing nothing. Reasons for anxiety will never be lacking, whether born of prosperity or of wretchedness; life pushes on in a succession of engrossments. We shall always pray for leisure, but never enjoy it. 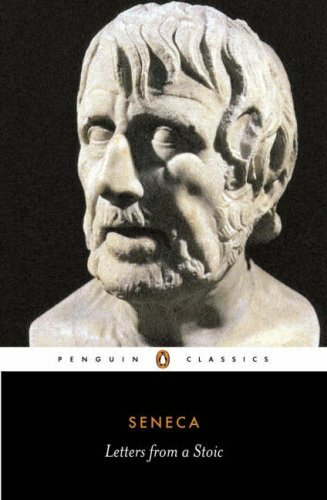 Seneca offers powerful insights into how to live in the moment without worrying about the past or future. Live fully in the now and realize that if you take advantage of this, you will live a full (albeit not necessarily long) and fruitful life. This entry was posted in Books and tagged How to Live Life, Philosophy, Seneca, Stoicism, Worth Re-reading on March 11, 2015 by Blas. Seneca’s advice to his friend is still fantastic several thousand years later. Covers everything from his thoughts on crowds to acquiring wisdom. Incredibly interesting book with many quotable lines and great axioms to live bye. There is too much gold to try to summarize. Do yourself a favor and just read it. Marcus Aurelius was the Roman Emperor from 161 to 180 and Meditations is a collection of axioms to live by that he never intended anybody else to see, forget being published and one of the most read books of all time. It offers incredible insights into his mind and how he perceived the world and wanted to live in it. This entry was posted in Books and tagged How to Live Life, Marcus Aurelius, Philosophy, Stoicism on March 10, 2015 by Blas. With short but sweet advice and pointed historical examples, Ryan Holiday envelops you in a Stoic world where people not only can conquer any obstacle, but take advantage of it, enjoy it and become better and stronger people because of it. Holiday is a very interesting guy who has worked closely with critically acclaimed author Robert Greene since dropping out of college at age 19 and I would highly recommend his podcasts with Tim Ferriss. Live in the present, day by day. Do not always try to figure out what things mean – why they are the way they are. As we all know, simple often does not mean easy. The themes in this book not only cover how to face and conquer obstacles, but how to live a happy and successful life. Much of the advice may not be novel, in fact much of it is Stoic and dates back thousands of years, but it is nevertheless invaluable. People are capable of anything as long as they don’t confuse perception with observation, can learn from their mistakes and can embrace the problems everybody undoubtedly will face with a clear mind, acting correctly and accepting the world as it is. This entry was posted in Books and tagged Philosophy, Ryan Holiday, Self-help, Stoicism on January 30, 2015 by Blas.